The Peterbilt Model 520 is a leader in the low-cab-forward truck segment with 32 per cent market share year-to-date through May 2018. 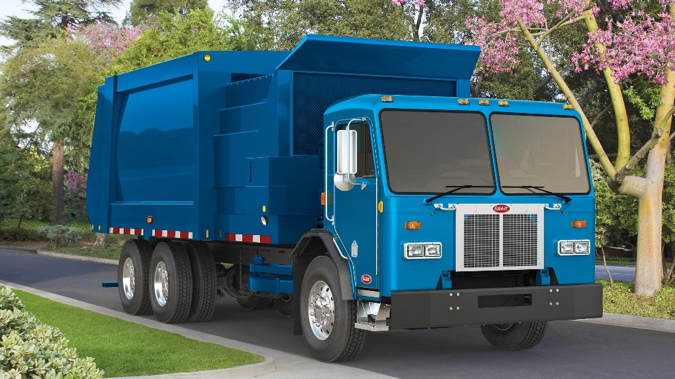 Peterbilt has designed a battery electric version of its Model 520 refuse truck, which is equipped with a 400 horsepower electric drive system, 350 kWh of energy storage and regenerative braking. The truck’s 80-mile range and quiet operation is an excellent solution for residential neighbourhood refuse operations. The truck emits zero emissions in a quiet manner, which is ideal for neighbourhood communities where these trucks operate. The truck’s regenerative braking reduces maintenance by 50 per cent through less wear on the braking system.